Upon first coming across the re-paved section of Myrtle Ave. from S. Main to Partridge, one might well wonder “with all this width, why didn’t they put in a real bicycle lane instead of these Shared Lanes?” Myrtle is a nice ride from Marion Ave. to S. Swan and a good way to escape the craziness of Madison Ave. or other routes to downtown. Appearances can be deceiving – what looks like a vast expanse of available macadam is actually much narrower than it looks. Myrtle is 28 feet wide curb-to-curb from Allen St. to Delaware Ave. If one applies NACTO’s standard*, the space needed for a motor vehicle parking lane and a bicycle lane is 14.5 feet (or a minimum of 12.0 feet, also the AASHTO* guideline). Therefore, until Madison Ave. has Protected Bicycle Lanes installed, Myrtle Ave. will remain a good – but shared – bicycle route to downtown. In the meantime, why not get out there with your Lufkin and find some streets that are wide enough for bicycle lanes? Then start pushing for them. 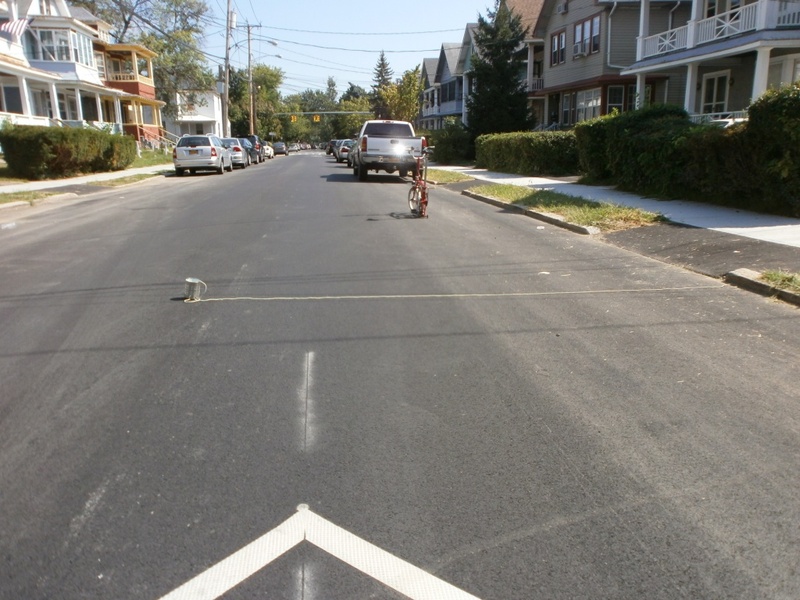 AASHTO – The AASHTO Guide for the Development of Bicycle Facilities: “If parking is permitted, the bike lane should be placed between the parking area and the travel lane and have a minimum width of 1.5 m (5 feet). Where parking is permitted but a parking stripe or stalls are not utilized, the shared area [parking plus bike lane] should be a minimum of 3.3 m (11 feet) without a curb face and 3.6 m (12 feet) adjacent to a curb face.